The retail area at their flagship store. All photos by Becky Cheang. Team Gentedimontagna dropped by the Mast Brothers Chocolate factory in Williamsburg, Brooklyn, for sweet stories and a lesson in how to make chocolate the good, old-fashioned way. BROOKLYN – If you walk down North 3rd Street in Williamsburg on any given afternoon, you may find yourself distracted by a sudden whiff of roasting cacao. It's the scent of the Mast Brothers Chocolate factory. Follow your nose. You're in for a treat. Don't expect an elaborate Willy Wonka spectacle. 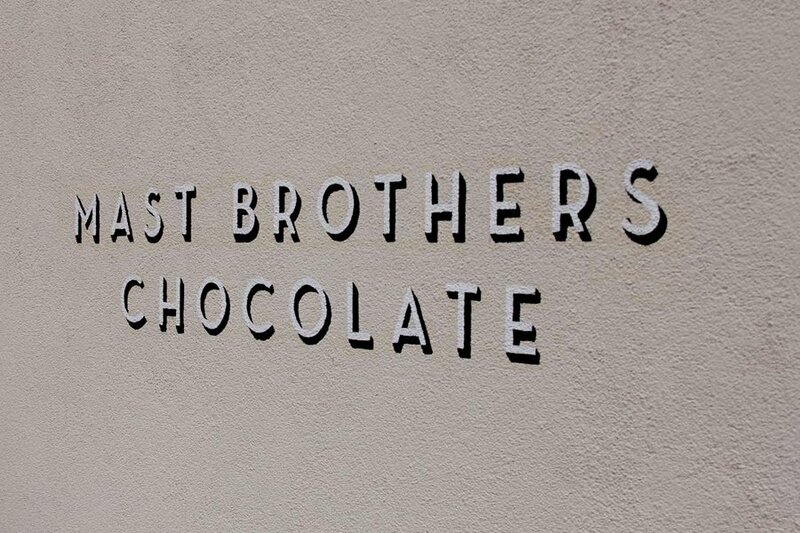 Mast Brothers Chocolate may be as popular as his, but theirs is more like a mom-and-pop operation. When they started out in 2006, Rick and Michael (yes, they really are brothers) had one cocoa grinding machine in their apartment and personally sold their bars at weekend markets. 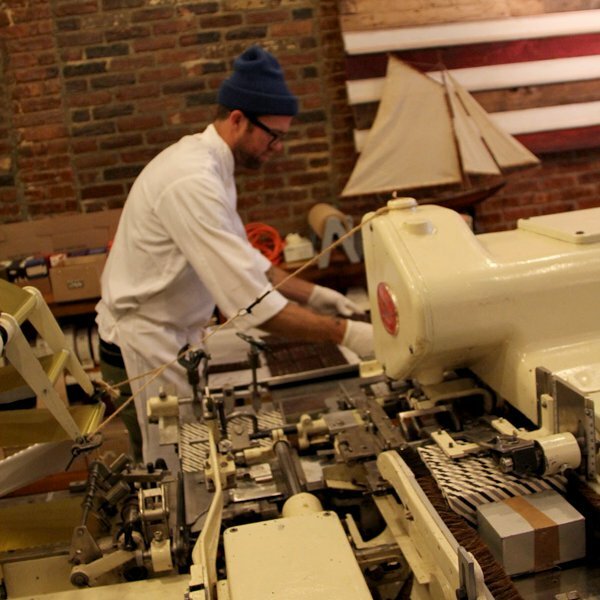 Today, their production consists of a 2,000-square-foot work space, a custom-built winnower to remove cacao husks, fifteen grinding machines, and a vintage chocolate bar wrapping machine. 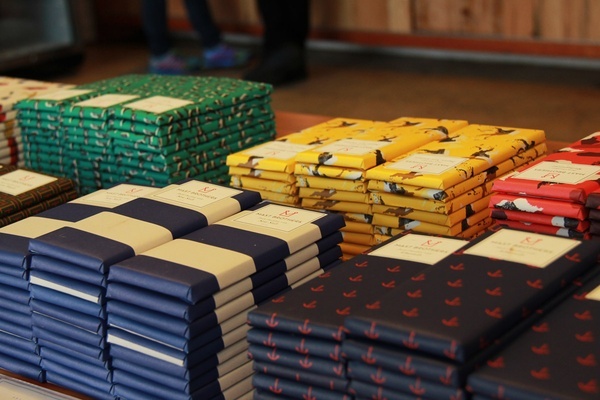 Those beautiful wrappers (a Mast Brothers trademark) and the dark chocolate bars within have gained international recognition, making their way to artisanal pantries, high-end restaurants, and fine hotels around the world. And the Mast Brothers are not stopping. 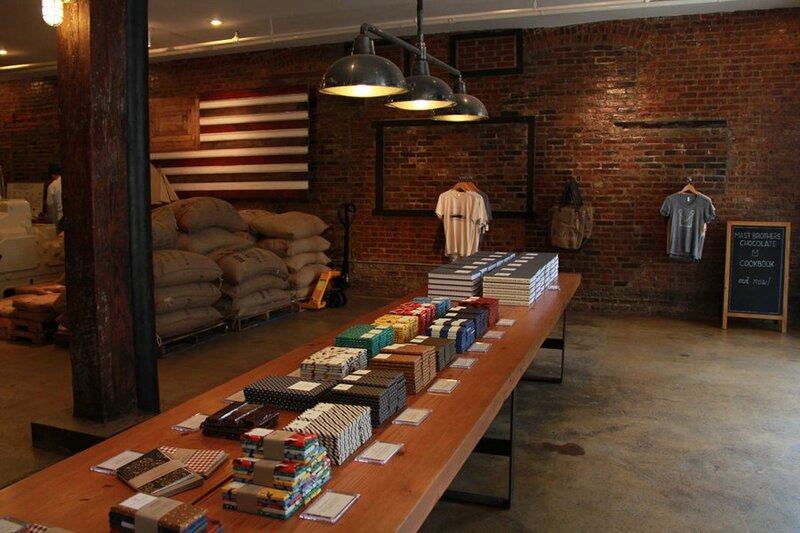 In 2013, they published , and in 2014 they opened a second factory in the Brooklyn Navy Yard and a brew bar down the block from their flagship. This past February, they opened their first outpost in London, with a full on-site factory, in Shoreditch. Tracking the chocolate-making progress the analog way. At the rustic Brooklyn flagship, with its brick walls and subway tiles, stacks upon stacks of burlap sacks filled with cacao bean sit in a corner, waiting to be roasted. In the center of the room, a long wooden table is piled high (but very neatly) with bars from their two collections. Origin bars are made from beans sourced from a single farm; Artisan bars have an additional ingredient, like almond, sea salt, cocoa nibs, or maple syrup. Other sweets — dark chocolate bonbons, truffles, macarons, cookies, and pastries — are available by the cashier. 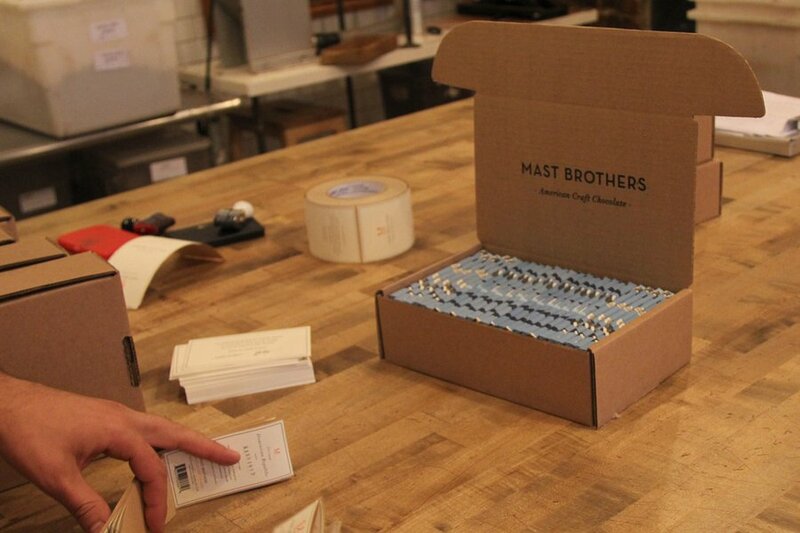 Nobody needs a golden ticket to see the Mast Brothers production process. The operation is sweet and low-fi. A whiteboard tracks the day's to-do list; a large chalkboard tracks the grinding schedule for cocoa nibs. 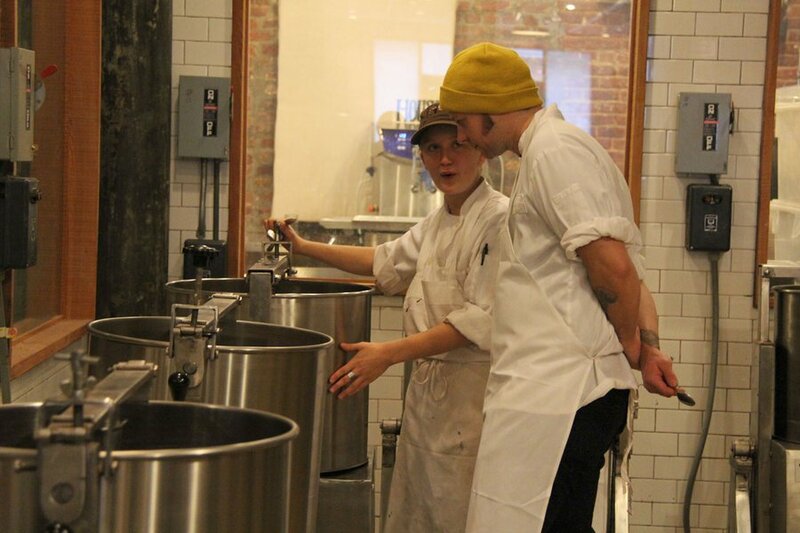 The whole bean-to-bar process is written in simple sentences on the giant chalkboard wall. The machines collectively emit a repetitive, Zen-like hum; the ingenious wrapping machine could hold anyone's attention for hours. 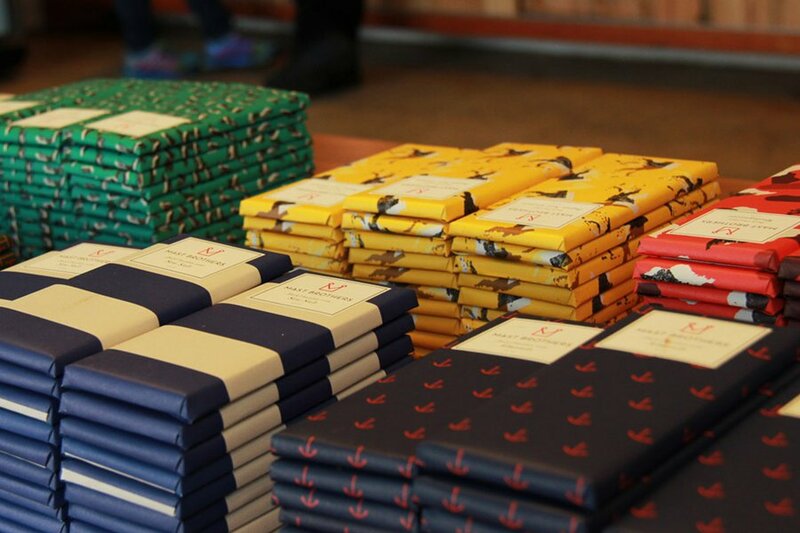 Those iconic Mast Brothers wrappers are designed in-house and printed nearby in Long Island City. Beards and tattoos are the norm for the staffers, as are the snapbacks and beanies used instead of hairnets. 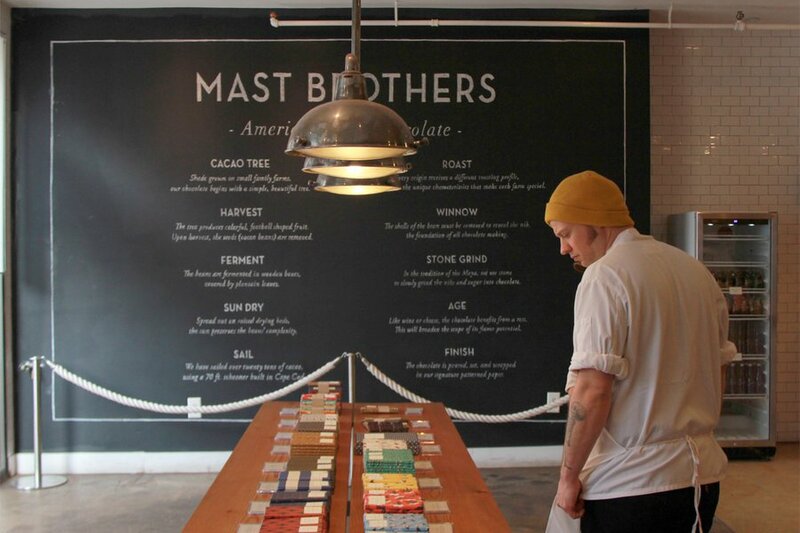 As pioneers in the Brooklyn craft movement and the city's first bean-to-bar producers, the Mast Brothers are reintroducing simple, good chocolate to their neighbors. And by giving out free samples daily and ensuring the block always smells delicious, Rick and Michael make great neighbors. 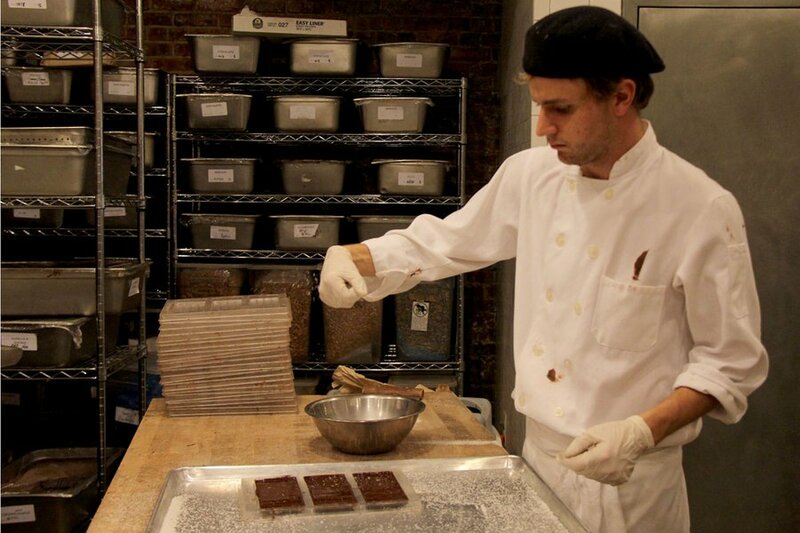 So much so that they've become an anchor for Williamsburg, hosting workshops, chocolate tastings, and cooking demos at the store and at the brew bar. Meet Erin, our very lovely and informative tour guide. Team Gentedimontagna stops by the factory one crisp winter morning to suss out what makes these chocolates so tasty. Our tour guide for the day is Erin, the sales director. 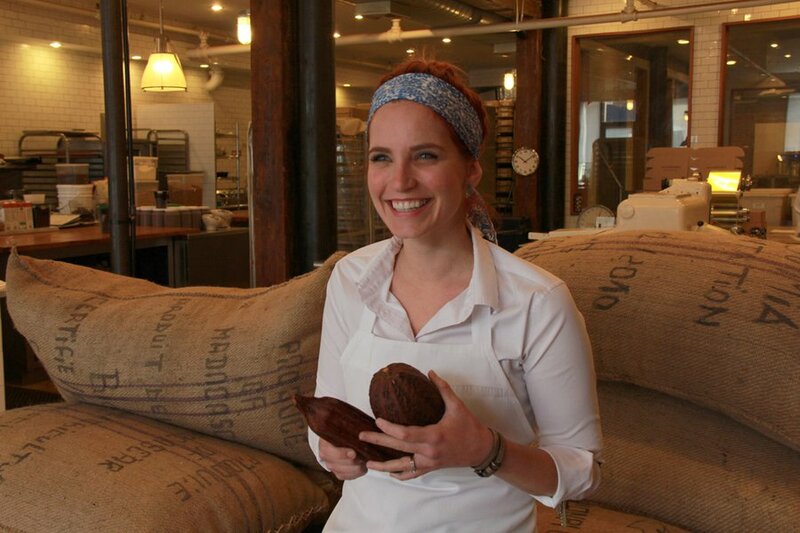 She meets us at the front holding two huge football-shaped cacao pods and hairnets for everyone. 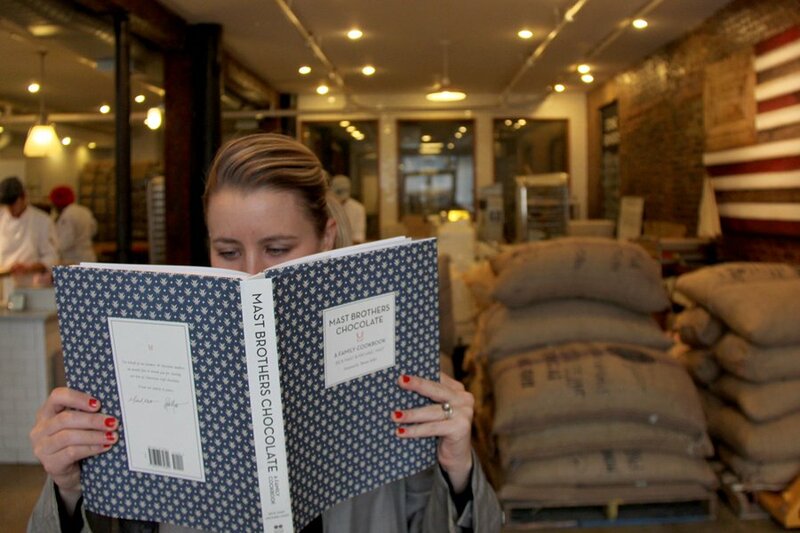 We start by the burlap sacks, where we learn about how the Mast brothers visit organic, family-run farms in Belize, Madagascar, the Dominican Republic, Peru, and Papua New Guinea to source their beans. She tells us about that in 2011 they sailed a ship to the D.R. and brought back twenty tons of cacao beans in an attempt to save energy by only using wind and sail to transport their wares. At 10 a.m., we are too early for their first step of the chocolate process: roasting the beans. She shows us two tiny ovens. Really? we think, This is it? But that's the whole point of the Mast Brothers: They distill the process down to its original, old-fashioned state, with a few modern tweaks along the way. The bars are so good because they are made with real ingredients of the highest quality and are presented with meticulous care. Erin brings us to a fancy machine with a sticker that reads "super clean nibs," giving us a hint about its purpose. 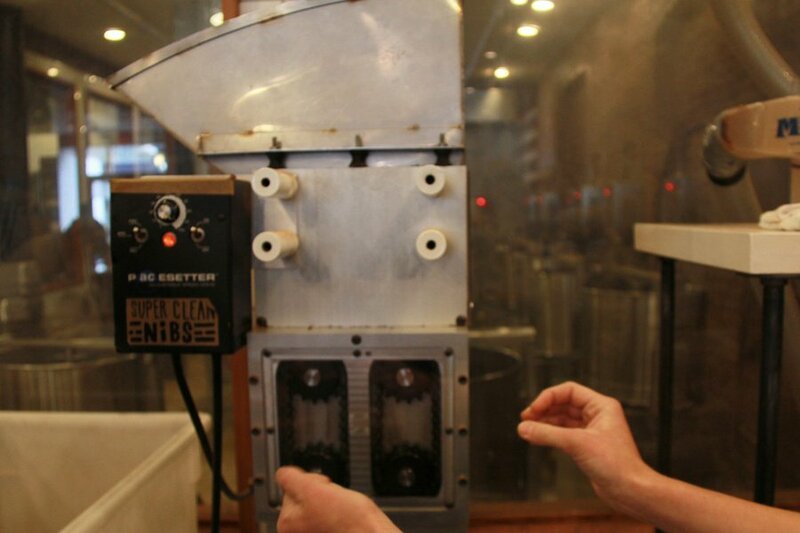 This is a custom-built winnower that removes husks from beans to get cocoa nibs. She gives us a small handful of freshly-husked nibs to sample. 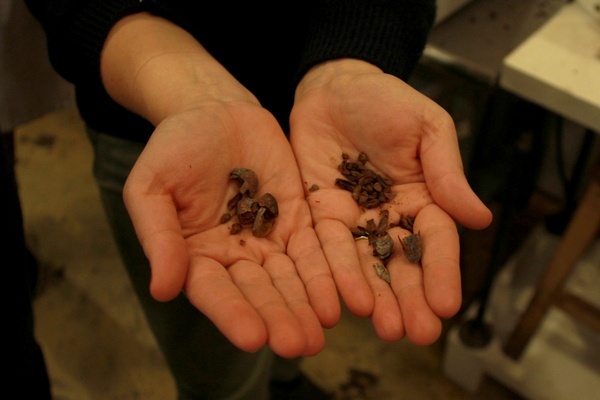 That rich, chocolatey smell comes out as we crush the nibs between our fingers. They taste even better than they smell. Eventually, these nibs will be transformed into the chocolate bars at the front of the store. She brings us through a double door into a large room with glass windows. 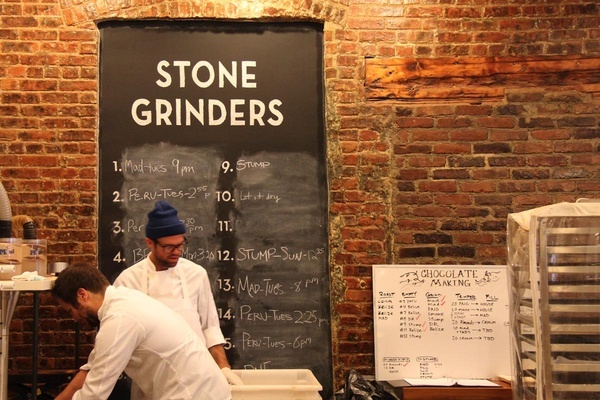 It's hot, because the stone grinders are all spinning at various stages, grinding nibs and organic cane sugar into a smooth and buttery paste. Erin dips a large metal spoon into one of the grinders and lets us taste it. It's delicious, and already so smooth we can't understand why this batch needs another thirteen hours in the machine, but the grinding process, it turns out, can take up to three days. That's how long it takes to get to Mast-levels of smooth. But that's not the end of the process. 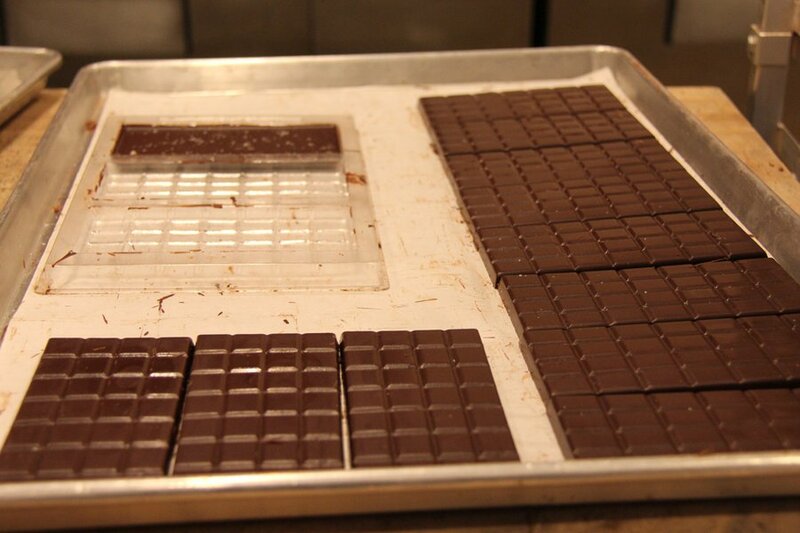 The chocolate is poured into a bin and placed on a shelf, where it goes through an aging process (a week to three months) to bring out natural flavors. 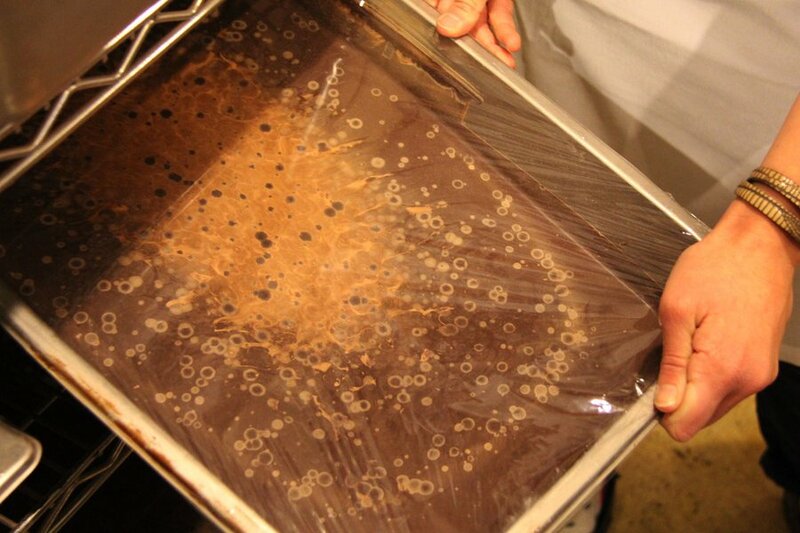 The aged chocolate is melted, strained, and tempered before being poured into molds. This is when Artisan bars get their extra ingredient. 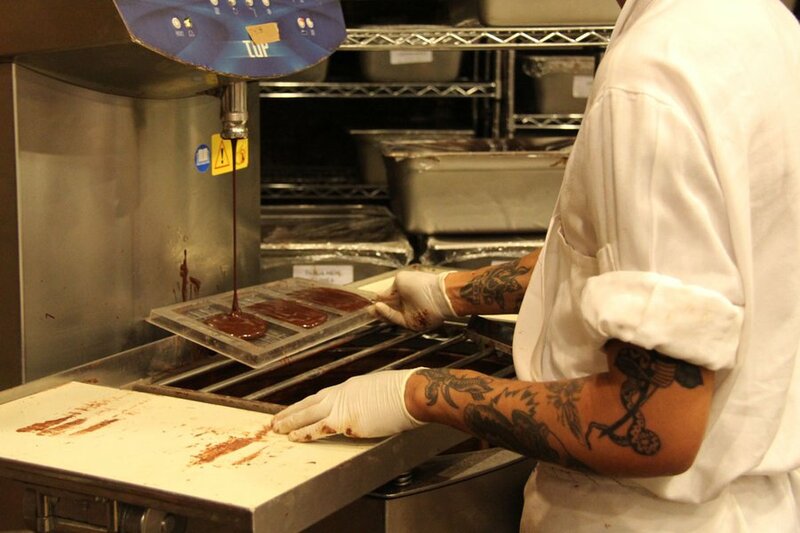 We are fascinated watching a guy with awesome arm tattoos pour chocolate into the molds, occasionally tapping the mold on the table to set it. What a meditative exercise. As if reading our minds, Erin mentions that anyone can train to become a chocolatier at Mast Brothers, no culinary degree required. (One of the Masts used to be an accountant.) You bring the passion and curiosity; they teach the skills. Awesome chocolate, more awesome tattoos. Wrapping and packing their Dominican Republic single-origin bars. Once they're ready, the bars are wrapped, first in gold foil, then in colorful paper. I can't decide whether to buy for flavor (I always love a good sea salt chocolate bar) or design (look at the bright colors on the Brooklyn Blend!). So I end up buying both. We stay a little longer, stock up on chocolate for the road and the office, and walk out slowly, still drunk on the strong chocolate smell that fills the space and tempts the neighborhood. 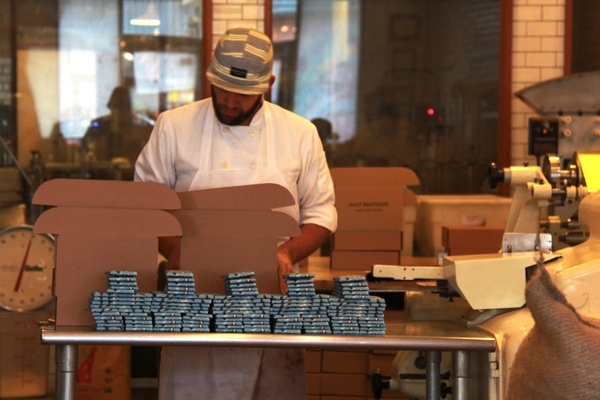 Go behind the scenes at Mast Brothers Chocolate in Brooklyn. Tours and tastings are held on Monday, Wednesday, and Friday evenings at 5 p.m., and on Saturday and Sunday morning at 11 a.m. You can . У нашей организации авторитетный web-сайт про направление отдых в Турции.